Q: Why should I childproof my home? A: Children learn and grown through being able to safely explore and discover the world around them, most of their time during the first few years is spent at home. Household injuries are one of the top reasons kids under age 3 visit the ER, and nearly 70% of the children who die from unintentional injuries at home are 4 years old and under. Many of these accidents are preventable if the proper childproofing measures are in place. Q: When should I start childproofing my home? 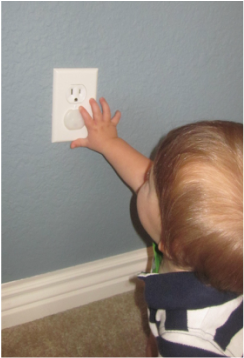 A: Childproofing is an ongoing process that changes with your child. There are hazards even for newborns. Some families choose to childproof even before their baby has arrived, while others wait until their child is more mobile. Keep in mind, your childproofing needs change and grown along with your child and should be reassessed on a regular basis. Q: How much does it cost to childproof my home? A: The cost of childproofing depends on the products you decide you need. Child Safe Childproofing will work within your budget to help you choose the most cost effective ways to make your home as safe as possible for your child. We will provide you will a full no-obligation estimate up front so you will know what your cost is prior to any installation. Q: How long will it take to childproof my home? A: In most cases you can have your entire home childproofed within the same day! Q: Do you provide installation services? A: Yes! We can install as much or as little as you would like! Q: Do I have to have a home assessment done if I already know what I would like installed? A: No! Some families feel pretty confident in their childproofing knowledge and will contact us with what their childproofing needs are and we can go from there. Q: What if I decide to not purchase anything after my assessment? A: There is no obligation to purchase any of the childproofing products we recommend. Our assessment is to be used as a tool to make you aware of the possible hazard and risks in your home. We hope that you can take your knowledge that you gain from the home assessment and take the proper measures needed to protect your child from them as best as you possibly can. Q: I have purchased my own childproofing devices, will Child Safe Childproofing install these for me? A: Due to a wide range of quality of childproofing products on the market today, we have strict standards for the products we will and will not use. Childproofing products you have obtained on your own will need to be inspected to make sure they meet our safety standards. If they do, Child Safe Childproofing will be more than happy to install these items for you. Q: How does hiring a professional childproofing company such as Child Safe Childproofing benefit me? A: Click here to find out! © Copyright 2018 Child Safe Childproofing. All Rights Reserved.